WEEK FIVE of the One Room Challenge!!! I thought that I was in great shape... HA!! Granted, the rest of the room is all but done, which is a relief! But my largest project has yet to be touched. Mostly because it has taken a little extra thought & careful planning. I have been teasing it since Week One, the closet. This tiny closet is odd... It is small. It is narrow. And the wire shelving isn't the most glamorous storage solution. 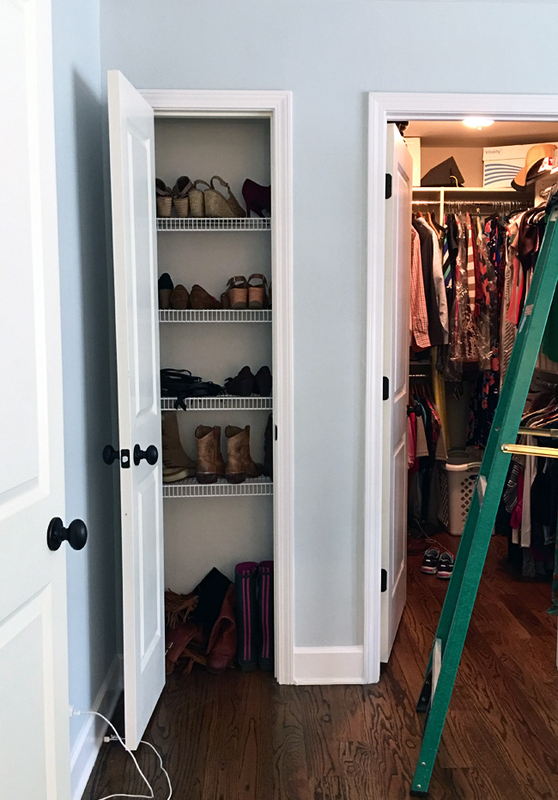 I loved the idea that my client was using it as an impromptu shoe closet, so I decided we needed to make it a real shoe closet!! Meaning, we need to actually make it functional to store shoes properly! The main issue with our project is the depth. This closet is only 9 3/4" deep. For this reason we cannot put flat shelves into the closet. As most of the shoes won't go in and fit easily front to back. Luckily she has small feet!! But still, I would love to be able to get at least an 11" deep shelf in here. The only way to accomplish this is to angle them. And to angle them, we needed a new tool! So we ordered this Dewalt Table Saw from The Home Depot & started cutting samples at different angles.